Scary robots demo the spatial awareness capabilities in HoloLens, which developers will be able to play with soon. 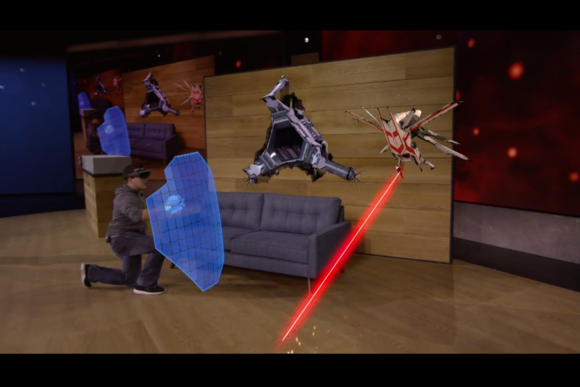 Microsoft’s HoloLens is getting scary—in a good way. At Microsoft’s hardware rollout in New York on Tuesday morning, spidery robot creatures virtually punched through physical walls and climbed over real furniture. This was an experimental game called Project XRay, showing spatially aware augmented reality that could react to a real-world environment. The Microsoft employee wearing HoloLens wasn’t fazed. Clutching an unnamed controller in his hand, a wearable hologram gauntlet appeared on his forearm. And then a vortex weapon. And then a shield. The employee used them all to fight back the mechanized horde. Spatial sound delivered the robots’ creaks and screams. In another scene from Microsoft’s Project XRay experimental game, robots punched through walls and the player held a wearable hologram shield. Microsoft’s Terry Myerson proudly showed off the advanced capabilities of HoloLens. “We’re bringing an innovative experience not possible on any other device or platform,” he said. The spatial awareness and spatial sound allowed for a more deeply real feel to the game. “Each room is unique, each game is customized to you,” Myerson explained. 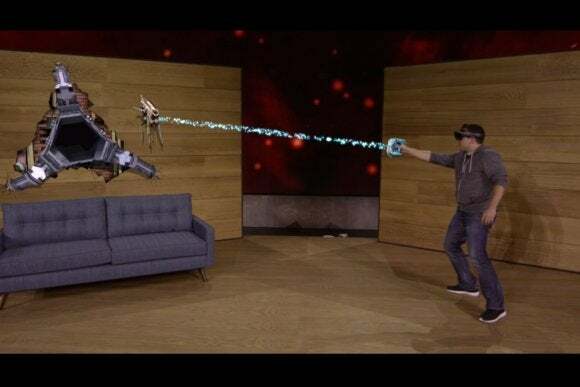 This was all a showy way of announcing the HoloLens developers kit, which Microsoft said would be available in the first quarter of 2016 for $3000. That’s a significantly richer price than the $350 you’d pay for an Oculus Rift dev kit—and you have to apply for it, you can't just buy it directly. Microsoft appears to think HoloLens is worth the expense and trouble. “HoloLens is fully untethered: No wires, no phones, no connection to a PC required,” Myerson emphasized, referring to the supplementary devices that virtual reality kits need. Why this matters: Microsoft’s HoloLens technology offers category-busting advances in an area of computing that could transform how we use technology in our everyday lives. It’s also a great halo product for Microsoft, showing how the company is staying ahead of the curve after years of seeming stagnant. Today, scary robots; tomorrow, who knows? That’s the kind of excitement Microsoft wants around its products.